If there were some justice in this world, wars and starvation would be extinct, the resources of our planet would be evenly distributed and Vulkan would fill an Ullevi or two and sail away from Avicii in the album charts. Their self released debut “Mask of Air” (2011) received very good reviews, earned the “album of the year” award by newspaper VF, got them t…o play at Sweden Rock Festival, and is a masterpiece according to the PC14 arrangers but even among progheads not many people know of them. One of the aims of Progressive Circus 2014 is therefore to spread the word of this fantastic ensemble and let their live magic sweep anyone with ears and a heart away. 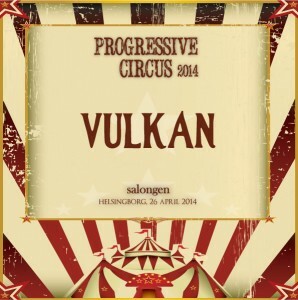 The setlist from their gig at Slottsskogen goes Progressive 2013 featured almost only new material that made the audience salivate and long for the release of the second Vulkan album that is in the making and will see the light of day during 2014. Until then, make sure you hear the material at PC14! The essence of Vulkan’s music is dark, distorted and dissonant. There’s plenty of lead heavy Tool inspired rhythmical riffs, providing a base for heartfelt Jeff Buckley style singing which accentuates their Mars Volta-ish approach to songwriting with many dramatic twists and turns. Other influences include Radiohead, Mew, Black Sabbath, Led Zeppelin and Frank Zappa. Both on record and live their name Vulkan (volcano in Swedish) hints at the bombastic experience that will hit anyone who gives them a try!